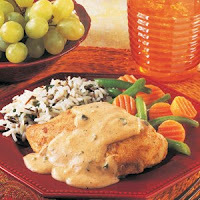 Sunday’s Wine Recipe: Chicken in Sour Cream by Linda L.
In large skilled, brown chicken breasts in 4 Tbsp. of butter. Turn occasionally. Sprinkle 1/2 cup of wine over chicken. Cover and simmer for 20 to 25 minutes. In a small saucepan melt remaining butter – add onions and cook until soft (but not brown). Add remaining 1/4 cup of wine; slowly stir in sour cream. Season with salt and pepper. Heat only long enough to warm sour cream. Remove chicken and pour sour cream sauce over it to serve. Serve with steamed rice or cooked egg noodles.